Rochelle & the Sidewinders is a local blues group comprised of seasoned veterans of the Austin music scene brought together by their common desire to play the Blues. Rochelle Creone is a dynamic and striking presence with a voice that cuts right through to the bone. 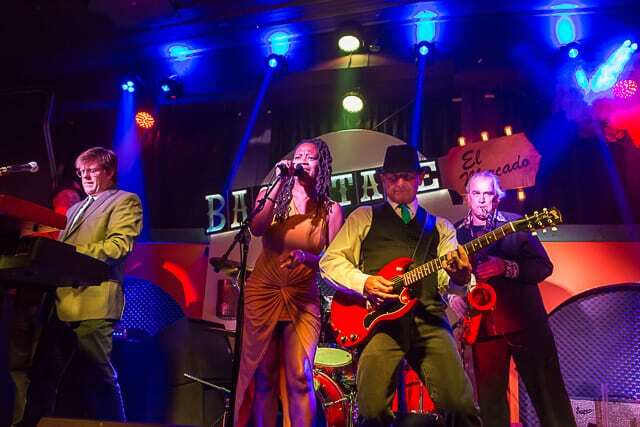 Two-time winners of the Austin Blues Society’s “Heart Of Texas Blues Challenge”, The Sidewinders recently returned from Memphis where they made it to the semi-final round in the 2018 International Blues Challenge. The band is known for their tight arrangements, catchy songs and engaging live performances. 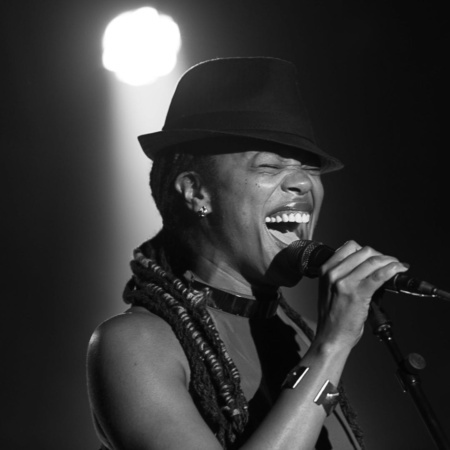 You can catch Rochelle & the Sidewinders at Cedar Street Courtyard every Sunday in June from 3pm-6pm. We chatted with lead guitarist Tom Coplen to learn more about the band. We’re excited to have you guys as our Artist of the Month! How did you get involved with the Austin Music Foundation? Our involvement with AMF began with a consultation with Einar Pedersen last August. Einar was extremely helpful in suggesting improvements to our website, CD marketing, our social media platforms and organizing and focusing our goals. All of this was done in a very friendly, thoughtful and helpful manner. Additionally, we have participated in a joint venture panel discussion that was sponsored by AMF and C3 Presents during SXSW 2018 focusing on tour/club bookings that was very informative and fun! What’s happening this month for Rochelle & the Sidewinders? Where can we come see you guys? How long have you all been playing together in Austin? What brought you all here and how did you meet? Our three year band anniversary is this month! I (Tom Coplen, lead guitar) had a few bands based on this format in the past and wanted to try another one. I put an ad in Craigslist on a Sunday night at 7PM. Rochelle, at her husbands prompting, finally decided to pursue her musical ambitions. She had never sang before, except in church, but always wanted to be in a band. Rochelle saw the ad at 7:05 and called. It was “musical love at first sight” and the two of us have been marching forward ever since! I have been playing with our drummer John on and off since the 90’s and John, Jim (sax) and I performed together for a few years in a local rock-a-billy band. Our keyboardist Thomas attended a show we played in Llano. He sat in with us and has been with us ever since! Adam, our bassist was another amazing Craigslist discovery. What are some of your favorite venues to play in Austin? We love all of the venues we perform for different reasons but we have to say that The Skylark Lounge is our “home-away-from-home!” Everyone there treats us like family and we love the vibe at the Skylark! We also love being at Stubbs, The Saxon Pub and Backstage El Mercado and of course, Antone’s! What has been the biggest musical accomplishment for your band so far? That’s a hard one! Etta James is always the first person that comes to mind when someone asks about our influences so I guess she wins! Where do you find your biggest inspirations in life and in music? We think our biggest inspiration for life is Music and our biggest inspiration for music is Life! What does it mean to you to be named AMF’s Artist of the Month? We are over the moon excited to be the AMF Artist of The Month! To be included in the amazing company of the previous recipients in humbling to say the least – THANK YOU!!!! If the band had to choose a show to binge-watch together, what would you choose? Easiest question so far – Monty Python of course! Last and most importantly, how can we support your band?! Where can we buy the music, and how can people find out about future shows and new releases? Our website, www.rochelleandthesidewinders.com, has our complete schedule. You can purchase our CD there or hear our music on Spotify, iTunes, Amazon or Pandora Radio. We would love to see you at our shows! Our live performances is where we really shine – we put on the same energetic show for 25 or 1000 people! We never ever play the same show twice and everyone is guaranteed to have a good time!